It's been a while as I have been posting on mad4yak, I still will be posting on mad4yak but I plan to keep this page up and running also. It is that time of year again when we start think about porbeagle shark and tope. 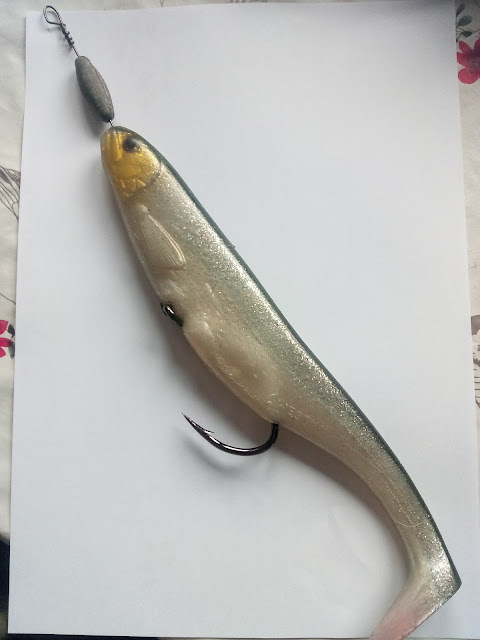 Though the tope will not really show up until May it is nice to get some rigs made and be ready to fish when the chance arrives. The unforgiving Porbeagle Shark has by now landed on our shores leaving us all very keen to get out there and have a go. I as always will be fishing from my kayak which currently is an Ocean kayak Trident 13, 2018 model. This kayak is well able to do battle with a Porbeagle shark, as long as you are. Though the biggest disadvantage is hauling large blocks of chum as most boat anglers do. 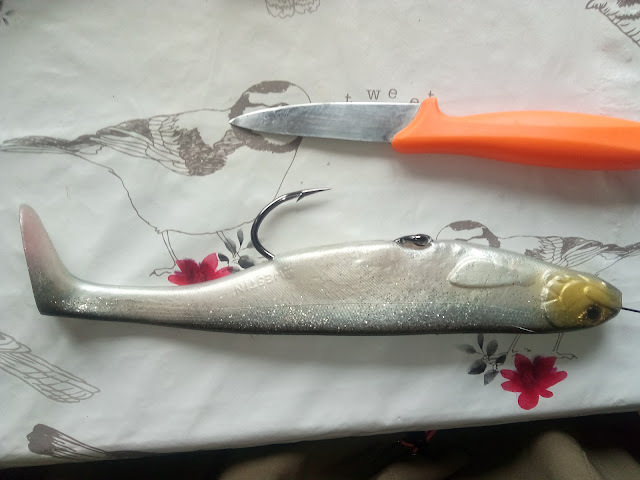 Instead I drop a shark bait halfway down and fish for what ever bait fish are around me at the time, this can be pollock, coalfish, herring, mackerel, whiting or cod. My favorites are coalfish and whiting, preferably around 3/4lb mark. Saying this, nothing gets the adrenaline going more than a Porbeagle chasing a lure to the surface. It is a pure adrenaline rush. Literally I do be shaking with the adrenaline. So heres how I have rigged a Westin Shadteez and how I plan to fish it. 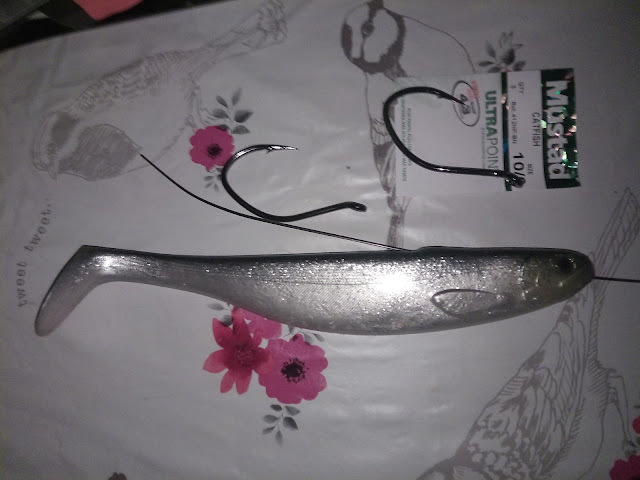 First off was hook placement, as using large hooks will change how the lure swims. I am using 300lb single strand wire with 10/0 mustad catfish hooks. I had a little mess about with rigging it with the hook on top like you would if was a giant jig head. Though with the hook being so big it would no doubt swim upside down. I was convinced it would work with adding weight to the belly so I decided to rig it through the belly. With the wire re-positioned to the belly I wanted the hook tucked out of the way and not put the sharks off from taking the lure. 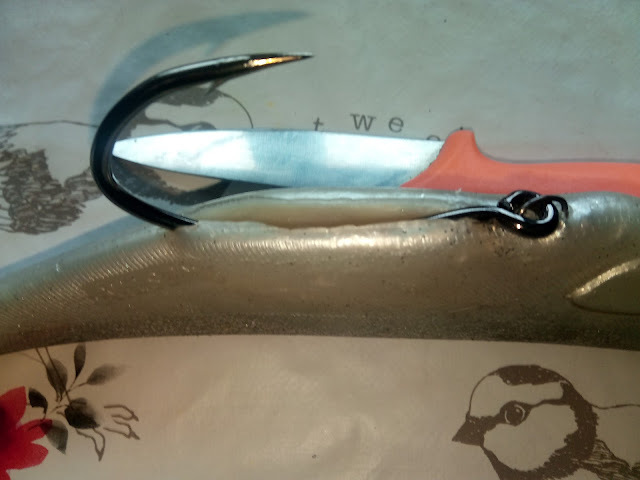 With a sharp knife a slit was cut in its belly to allow the hook to be held in place and give a more natural presentation. Hook in, all that was needed was some glue and I was happy. I added just one ounce to the nose on the wire before making the eye in the wire. 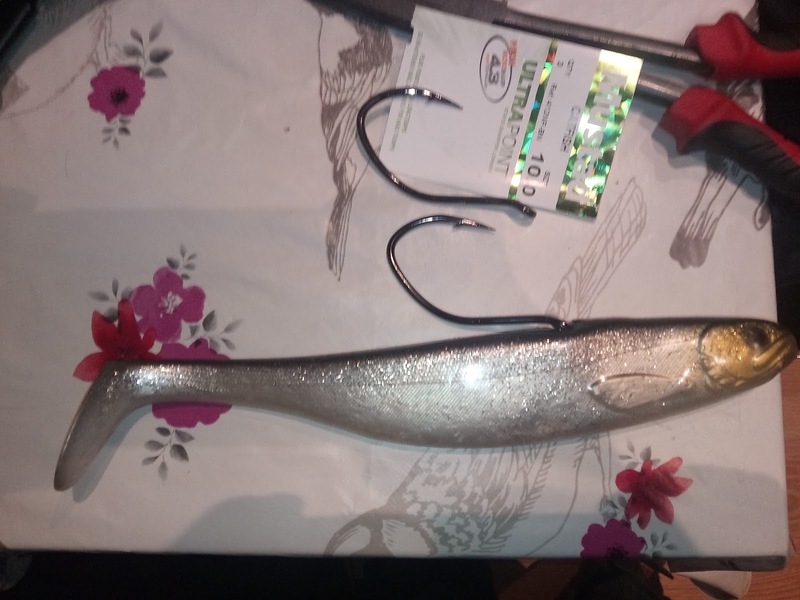 The shadteez though not weighted sinks quite well and the area I will be fishing will be no more than ninety feet deep the lure will have more natural when rigged as light as possible. Two Porbeagle shark in one session. Hi all, yes you read that right. I was out last sunday the 28th of may chasing jaws and family. Its hard for me to believe I posting about 2 porgies in a session, as at one time I was thinking they where a myth and would be over the moon at one per season. But hey new tactics and new stratagies have payed off. Sunday was my third trip after them and using the Vanstaal 80lb to 130lb class rod and a Dam quick royal 990 I am well equipped to tackle near any beast out there , well I hope in anyway . Sunday came and the fore cast was to settle down about 1pm and I was busting to get some good under water video of sharks so I went out at eleven with the intention of getting video first and then go after sharks. As I paddled out it was very lumpy out side the shelter of the land with the boat men getting a hammering. I hugged the shore trolling a live coalie all the way with no interest from sharks. I got to my mark and all was quiet I lowered my camera and coalie down to try and get a shark to chase it to no avail. 5 mins later the radio crackled into life with Alastair saying he had a double hook up and they were decent fish. I was shaking with the excitement and although the swell had not died down yet I was baiting up the shark rod. 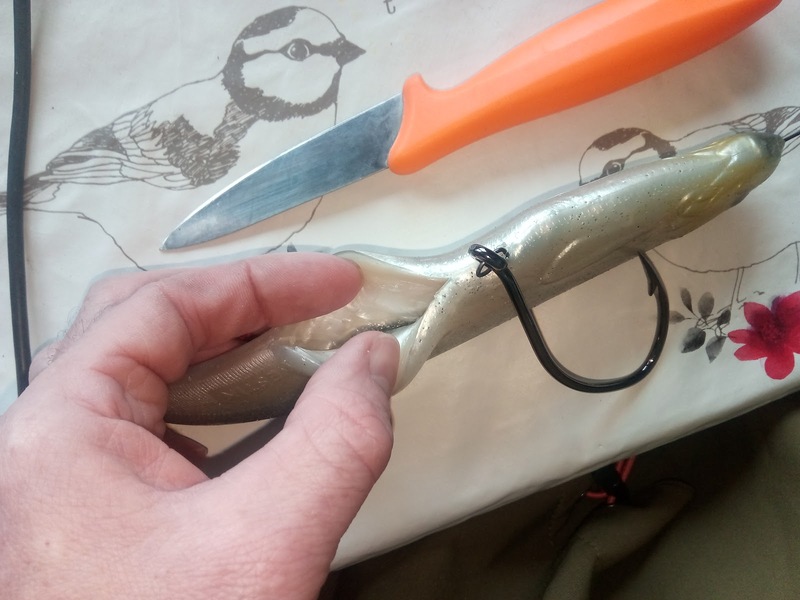 As I was rigging my shark bait(takes a while when your shaking like a leaf ) my rod with the camera on bent over and began to head off then POP the top of the rod sprung up. I grabbed it praying my camera was still there and thankfully it was, but as I reeled it in I could see a large shape coming up. believe me your heart nearly stops every time they do. coming up like a torpedo and turning at the last second under your kayak and then circle you. It is a class experience. I flung a mackerel flapper over the side and let it down about 20ft. He went after it and looked at it, poked it and swam away. I gave it a big lift and dropp and back he came like a shot and grabbed it. What happens next is always an unknown, will they run on the surface, dive straight down or knock the hell out of you before peeling off a 100yards of line. This one run like hell under the surface and as he was about 120lb I could tighten the drag and let him tow me all over the place. Unfortunatley this lad found a crab buoy rope so I had to heave like hell to keep him from wrapping. Thankfully after a very tough fight I got him up to the surface. That shark was released in a blaze of white water and it was still very early. I was wondering will I try for another and began to paddle back to my mark, but 100yards into the paddle as the adrenaline subsided my right should started to spasm like mad and was a tad sore for as I went and was putting me off trying again, but as I got closer to the mark I am not sure was it the excitement at trying again over powered it or it faded but hell I was going to try again . 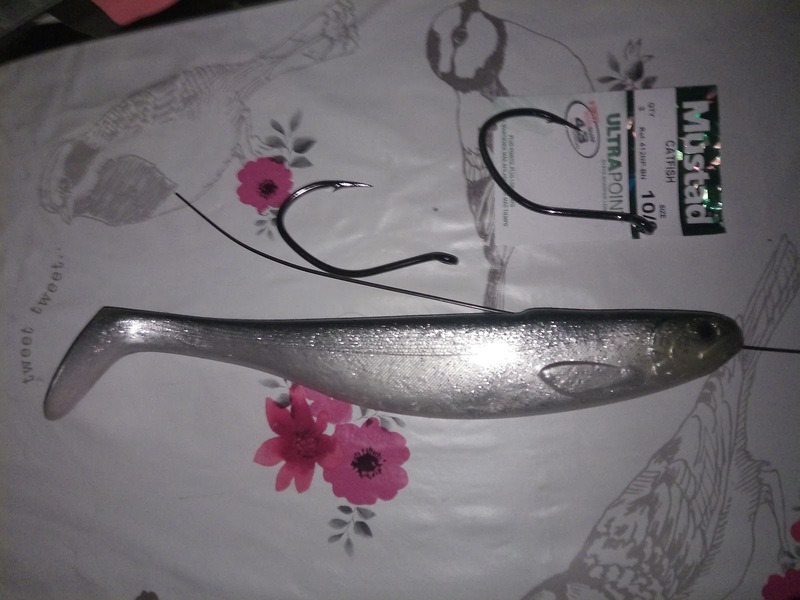 Again a bait went out and I began to chunk away with bait fish and didn't see any sharks until I went to move away and out of no where came a nice 150lber powered up and grabbed my bait. Rod still in the holder it poured line off the reel with me being towed side ways, as is becoming the norm these days . I got the rod in hand and another epic fight was on. again lots of drag and a really tough fight forced the shark up to the surface in good time. But this bugger was mental. I had the trace in hand holding tight for the 3rd time and with a swipe or two of it's tail near filled the kayak cockpit. All in the video below. I was just glad I didn't get whacked with it's huge tail. Porbeagles 2018 came in with a bang. Also a shark trying to fight with my kayak, all in a weekends porbeagle shark fishing from a kayak. Here's my catch report in the form of a video. The swell and the shark having a pop at the kayak was considerably more dramatic in real life than the video. But it will give you a tastier of how it went. Pollock bashing on a lumpy day. Through the wonders of our forum myself and Mike [from Galway] met up in a sheltered bay in Inishowen for a session at what ever may turn up. It was a mere 6 degrees but in the sun shine it seem quite nice. We first went out and had a look for herring but ended up catching a decent few small mackerel. Though there was very little else. So with that we headed in for a bash at the pollock and maybe a wrasse on the lure. In the bay it was sheltered enough but once outside the bay and with in 200yards of the rocks the decent lazy swell was busting up the rocks and making it quite treacherous to be in close. Though how could we not have a few casts before getting out of there. Smallest ones to start us off. Every time I cast the lure in it was FISH ON. Litterly a fish a cast and all good fish. Think the smallest was about 3lb, it was class. Though it was dicey I said to Mike about three times we should go, and the two of would go ah sure another cast or two . But after half an hour with the tide building in strength that we would have to paddle against and the swell making it interesting we head for the shelter of the bay. We both continued fishing inside the bay and we did catch some more fish but nothing as thick and fast as it was outside. So you can nearly guess what happened next, we went back for a look and the worst of the swell had half settled so we went back and the fantastic fishing continued. I ended up with four pollock just under 6lb and at least twenty between 3 to 4.5lb it was great fun on light gear. I had them all on a 20g HTO lure very similar to the fiish lure. It worked best fished close to the bottom. We called it a day in good time to get in before dark though it was bitter cold when were unloading the kayaks it was down to 2 degrees a tad nippy on the hands. A very enjoyable day and it was good to meet up with a new member of the club. copyright GSmith. Picture Window theme. Powered by Blogger.